FRUGAL IN DERBYSHIRE: Ey Up Me Duck ! "Ey up me duck"! - that is Derbyshire for "Hello" - honest ! I'm having a very DERBYSHIRE Day today. For my friends from across the seas, Derbyshire is in the heart of England and very beautiful it is too. 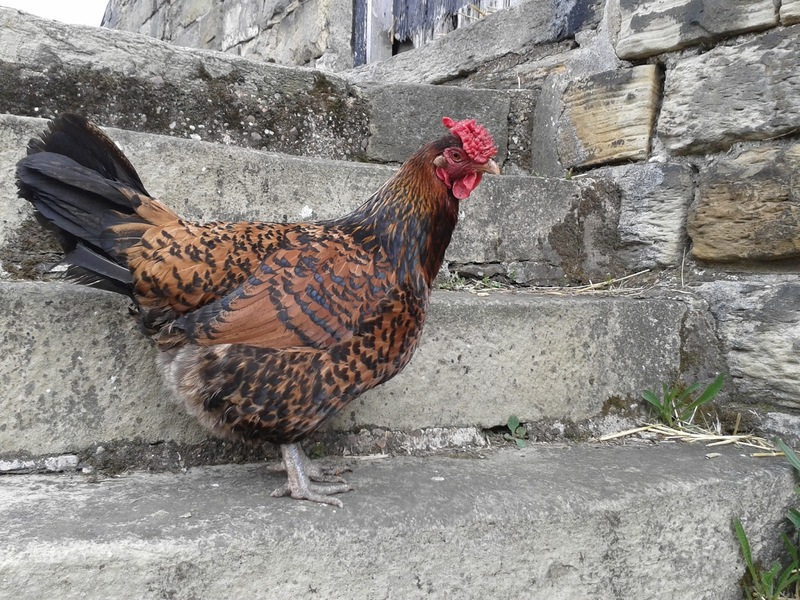 We have much to be proud of , some well known and some not so well known, as with our very own breed of chicken The "Derbyshire Redcap" This is an endangered breed and some might say rightly so for something that looks as though it carries it's brain outside it's skull!! We have three DR hens at present and are hoping to get a new cockerel soon (old one popped his clogs at a good age) as, though they put up with the amorous antics of a Black Maran (Russell) and a Buff Orpington (Hugh) I'm sure they would prefer someone who is of their Culture, with whom they can have lovely Derbyshire children. 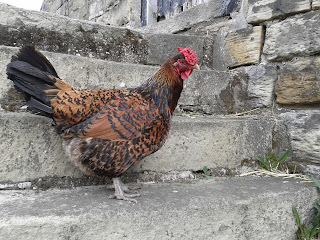 This particular hen is climbing the hay loft steps, hoping to find a place to lay eggs that I haven't sussed. It's part of the game they play with me ! She looks a little cross that she has been found out! Something else that Derbyshire is famous for is that the famous "Bouncing Bomb" ( have you seen "The Dam Busters" ?) was tested at Ladybower Reservoir in the Derbyshire Hills. The bombs were carried by Lancaster Bombers. Today was the 70th Anniversary of this and the only remaining air-worthy Lancaster Bomber flew over our house today on its way to Ladybower where it would be met by two other WWII aircraft. in homage to this event. We knew what is was as the sound of a Lancaster is so unique and can be felt in your chest. We ran outside to see it fly past, but unfortunately I didn't have time to get my camera. I'm not too fond of aircraft or of flying for that matter, but there is something about this particular plane that makes me emotional. Enough of this Gill, pull yourself together! I think I might pursue the Derbyshire theme more another day. Lovely tea tonight- Cheese, onion and potato pie with a winter stirfry of onions, carrot, cabbage, swede, garlic and celery. Followed by Rhubarb and Custard. Oh yes, we know how to live !! I'm off to bed to read now. Will decide which book to read when I get there. I usually have at least four books on the go by my bed. Thanks ever so much for bearing with me and reading my blog. Why Hugh .... this is the question ... you know which interesting cookery type man pops into my head! Wish I could have seen the Lancaster .. we just get lots of jets .. RAF Valley just up the road is a training base. They can be SO noisy.